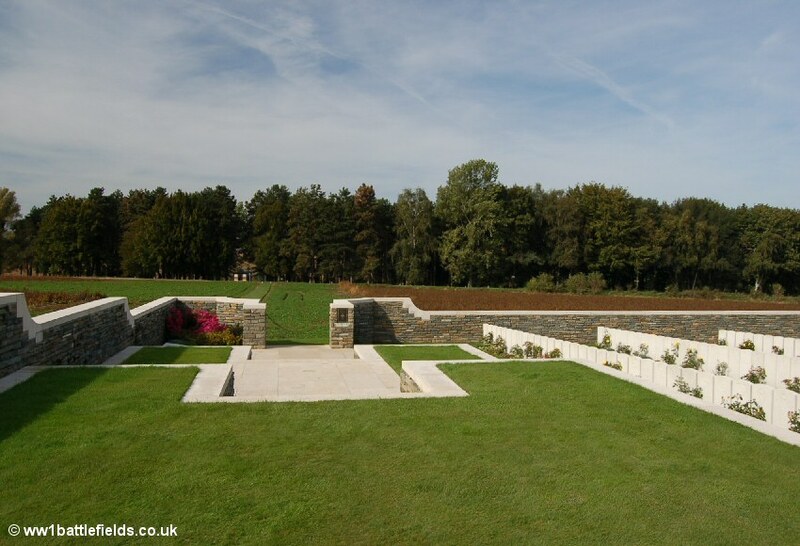 Serre was one of the strongly fortified villages held by the Germans at the start of the Battle of the Somme in 1916. The village, about five miles north of Albert, was the most northern point of the main attack on the 1st of July 1916 (although there was a subsidiary attack at Gommecourt, a mile or so further north). Serre today is just a small cluster of houses and a farm on the D919 road. However, the area west of the village has a number of small cemeteries, the remains of trenches, and the Sheffield Memorial Park in close proximity, and is one of the more popular stops for battlefield visitors, including school parties. The map below shows the location of these. The dotted lines are footpaths or tracks. In terms of guidebooks, the Holts’ Battlefield Guide to the Somme covers this area well, and is generally an excellent guide to the Somme battlefields. 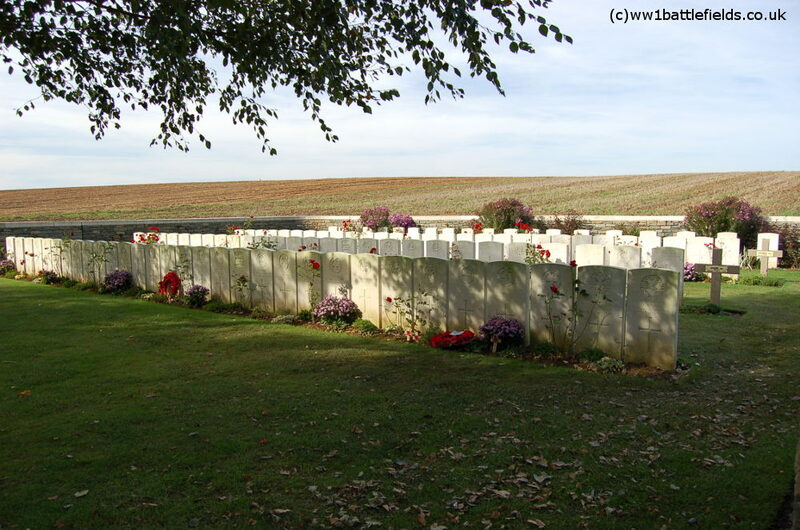 Walking the Somme by Paul Reed has a walk covering the Serre area, starting from Sucrerie Cemetery near Colincamps. The best historical book to read in relation to the Somme and the 1st of July 1916 in particular remains Martin Middlebrook’s The First Day on the Somme. Just before you reach Serre coming from Albert, on the left hand side of the D919 is a track with green CWGC signposts to several cemeteries, including Luke Copse (see later). There is an area of grass at the bottom of this track where you can park, or else park in front of the nearby Serre Road Cemetery No.1, and then head up the track to the Sheffield Memorial Park area. It is sometimes possible to drive up the track, but it can be quite rough.Following this track uphill, a small cemetery appears on the right just as the track also forks off to the right. 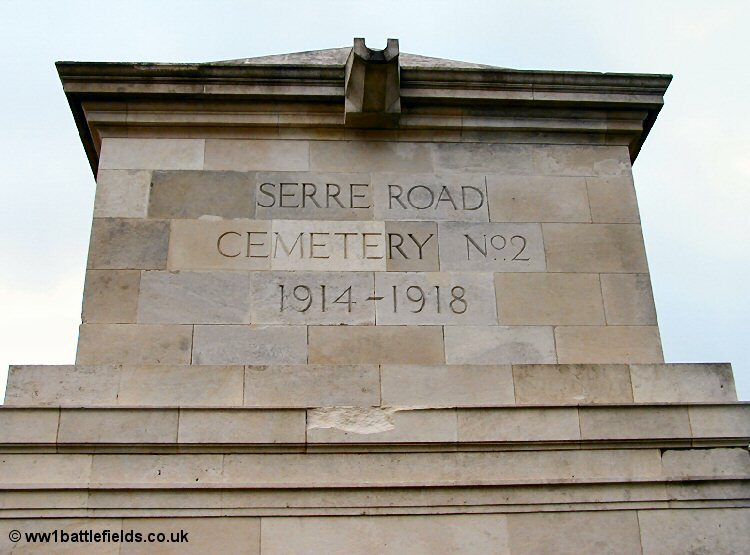 Unlike the much larger Serre Road No. 1 and No. 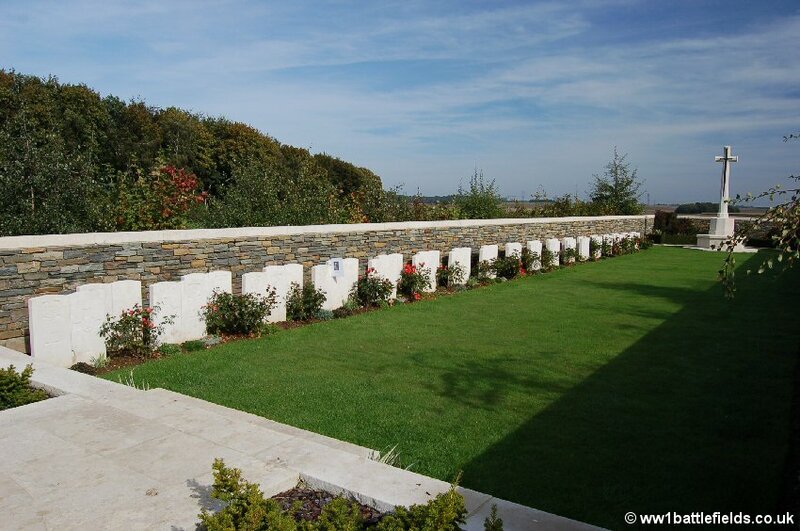 2 cemeteries, which can be found by the main road (see later on this page), Serre Road No. 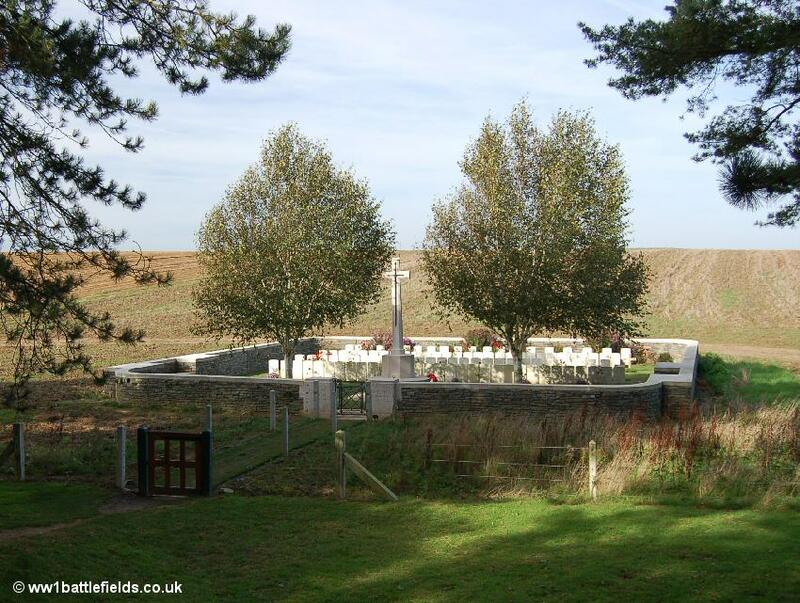 3 is a small battlefield cemetery with only 85 men buried here. More than half of these are unidentified, and there are also headstones bearing two names. This cemetery was one of several made by V Corps after the Germans withdrew from this area in 1917. 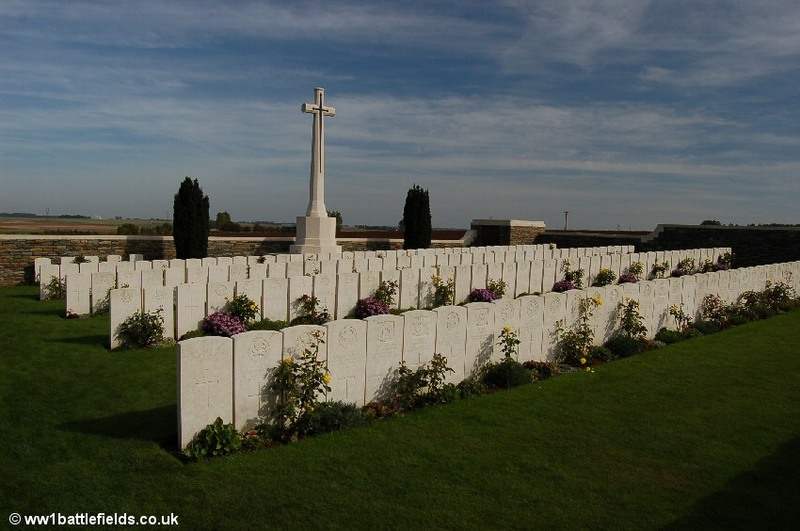 Most of those buried here fell on the 1st of July 1916, and there are special memorials to three men known and two more believed to be buried in the cemetery. There are four main rows of graves, with a single unknown grave by itself at the back left of the Cemetery by the Great Cross. From the cemetery, following the track uphill leads to the Sheffield Memorial Park itself. 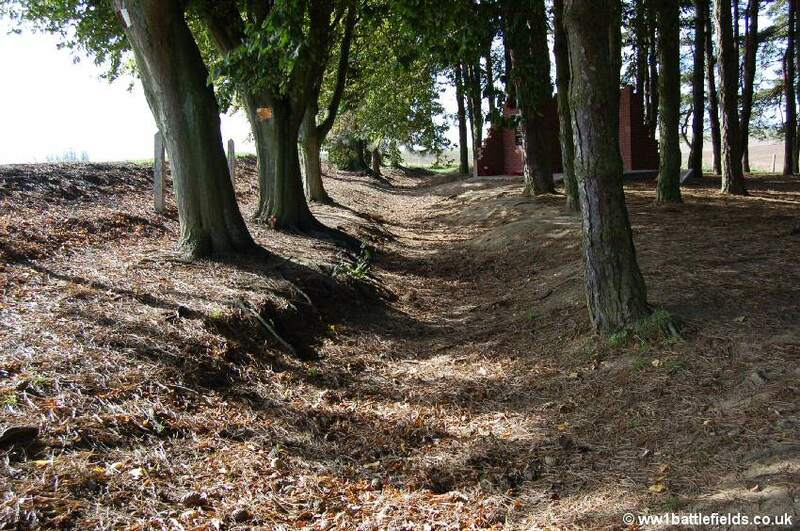 This is a wooded area where the original frontline trenches and the shell-holes in the ground have been preserved. It was first opened as a memorial park in 1936. There is an information tablet placed by Sheffield City Council near the front of the park. This has a coloured map, showing the positions of the various battalions here on July the 1st 1916, along with the German trenches and machine-gun positions they advanced against. At the front of the memorial park, the shallow outline of the original 1st of July 1916 frontline trench can still be seen – see left photo below. It was actually the Accrington Pals who attacked from the trenches here on the 1st of July. Beside the trenchline stands a stone cross in memory of Private Albert Edward Bull. Albert Bull was from Apperknowle in Derbyshire, and was with the Sheffield City Battalion when he was killed here on July the 1st 1916 aged 22. He is buried in the nearby Serre Road No. 2 cemetery (see later on this page). 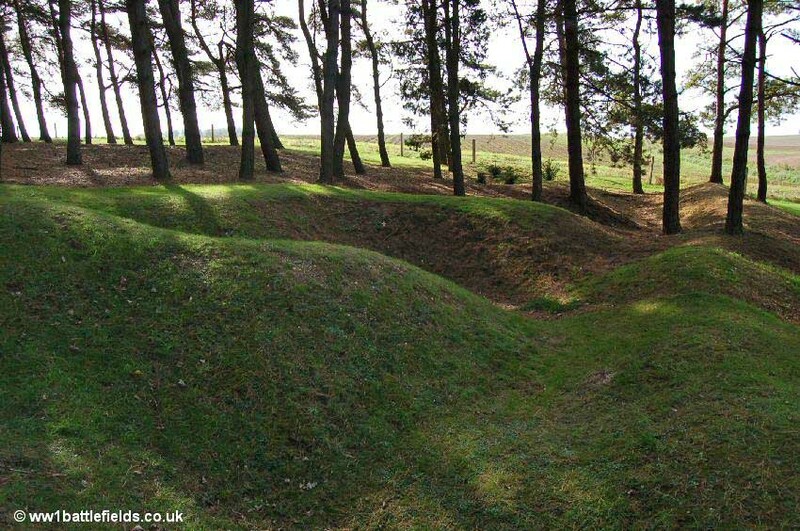 The memorial park slopes downhill, and the land still bears the scars of battle, with shell-holes and vague outlines of other trenches still visible today. Within the park are a number of memorials to the various “Pals” battalions that fought here or near here that day. The largest is a brick built structure commemorating the Accrington Pals, shown below left. The bricks used to construct this are known as ‘Accrington NORI’ bricks; they are very red in colour from the iron oxides in the clay, and the name ‘NORI’ apparently comes from the accidental printing in reverse of the word ‘IRON’. Right next to the Accrington Pals memorial are two smaller stone memorials with bronze plaques set on their fronts (picture above right). These commemorate the Y (Chorley) and Z (Burnley and district) Companies of the 11th East Lancashire Regiment. The inscriptions are in both English and French. At the base of the Chorley Pals plaque are the words ‘Where larks sing and poppies grow they sleep in peace for evermore‘. 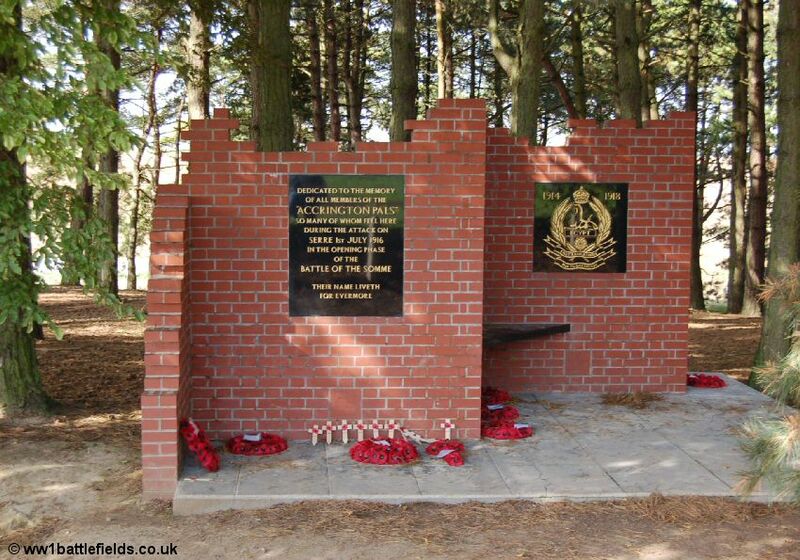 Another brick built structure, a shelter, is in memory of the Sheffield City Battalion (left picture below). This battalion suffered tremendous losses, with just under 500 casualties, which included 246 killed, plus a further 12 who later died of their wounds. Only four of the officers who attacked here survived. There is also a memorial to the Barnsley Pals, in the form of a black granite stone (photo above right). The funds for this were raised by businesses, the council and individuals from Barnsley, and it was unveiled in 1998, seven years after the last veteran of the Barnsley Pals had died. There are also various smaller commemorations, often in the form of wooden notices nailed to trees, throughout the park. A path leads down to a cemetery set in the valley just behind the memorial park. This is Railway Hollow Cemetery. A trench called Railway Avenue ran from near here all the way to Colincamps, over two miles to the west. The cemetery was originally known as V Corps Cemetery No. 3, and like Serre Road No. 3 was made after the Germans withdrew in 1917. There are 107 burials here, 65 being identified soldiers. 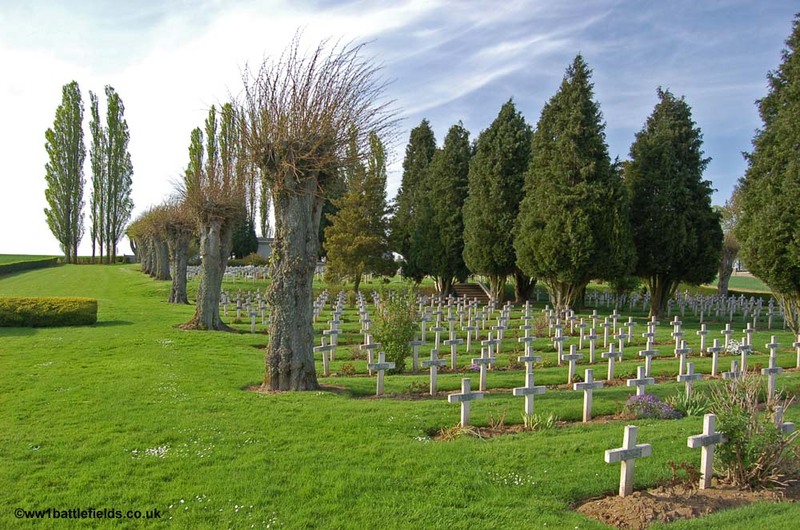 There are just four rows of graves, with a French grave at the end of two rows. he majority of the burials are of men who fell on the 1st of July or the 13th of November, 1916, reflecting the two major attacks in this area during the Somme offensives of that year. Just behind the lines here during the War were four copses, which were named on maps after the four apostles, Matthew, Mark, Luke and John. Continuing on the track that leaves from the front right of the Memorial Park, in the now tranquil fields which were once No Man’s Land is the beautiful Luke Copse Cemetery. There are 72 soldiers buried here, and of these, 44 are identified. 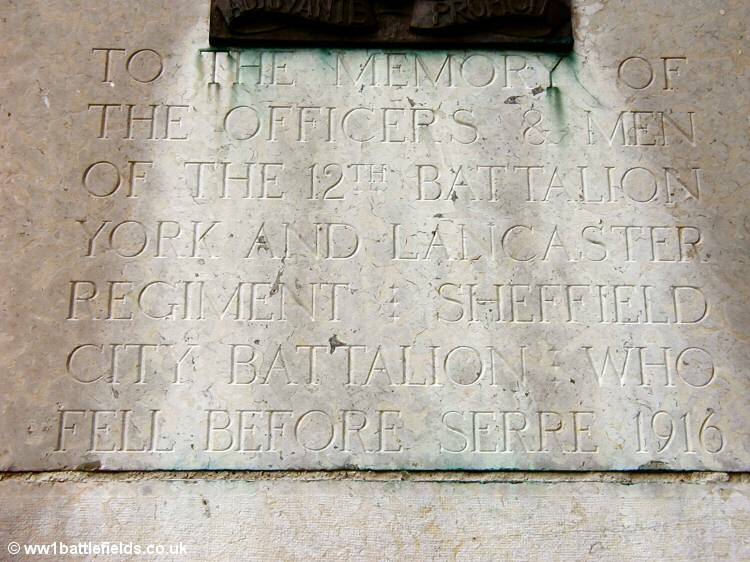 Fourteen are from the 12th Battalion York and Lancaster Regiment – the official name of the Sheffield City Battalion – who died on the 1st of July. The other thirty identified soldiers buried here died on the 13th of November 1916, when another attack was made on Serre. No ground had been taken here between the two dates. The later burials are mainly from the 2nd Suffolks. Again, this cemetery was made after the lines had moved away from here, when the Germans retreated to the Hindenberg line early in 1917. 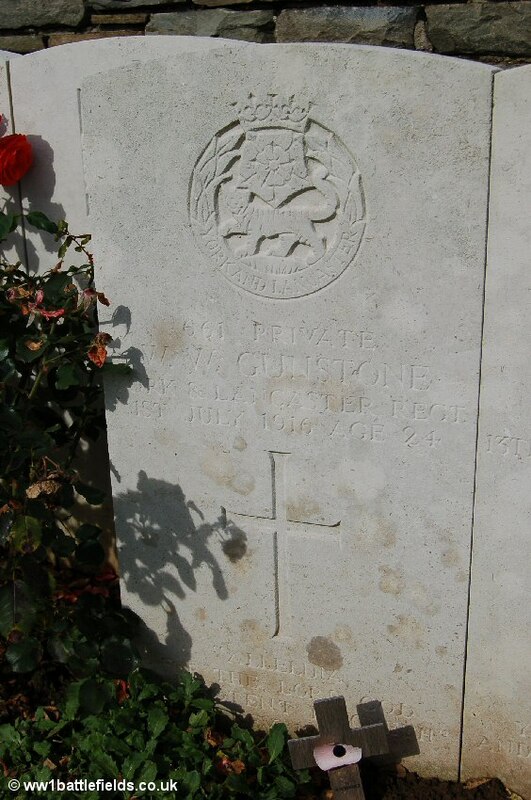 Two bothers are buried here who died serving in the same battalion on the 1st of July 1916: Lance-Corporal Frank and Private William Gunstone. Frank was the elder by a year, being 25 when he died. The brothers came from Nether Edge in Sheffield, not far away from where I grew up, and both served with the Sheffield City Battalion. The identical inscriptions on both graves read ‘Allelulia for the Lord God omnipotent reigneth‘. 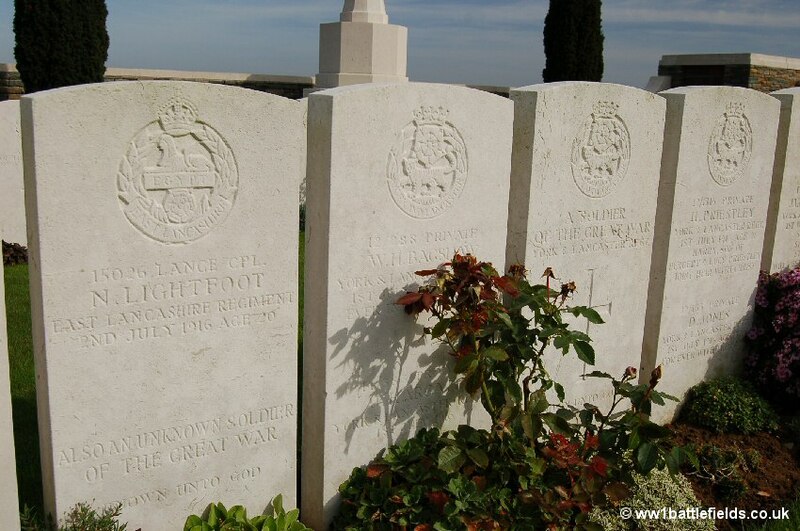 The inscription on the grave of Private Frederick Midforth from Hull reads ‘Just waiting for his loved ones‘. 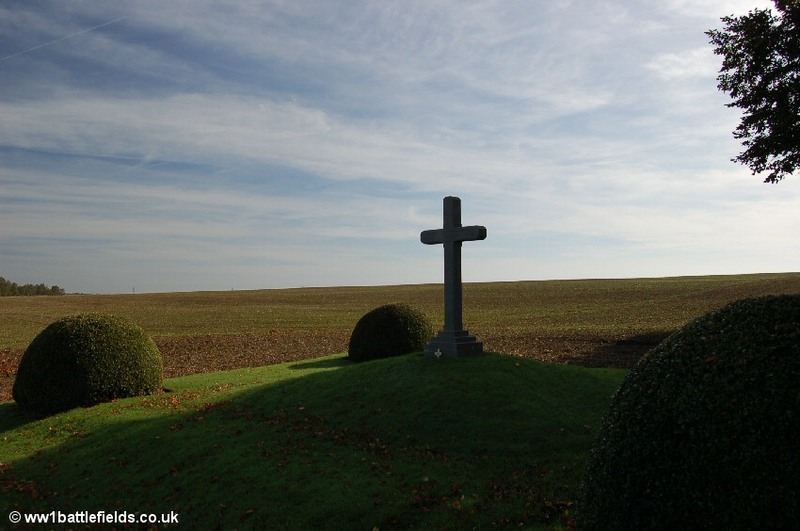 To visit this lonely peaceful Cemetery, from which several other small CWGC cemeteries can be seen in the fields nearby, is always a moving experience. The setting is so tranquil that it is hard to picture the destruction and devastation here on those days in July and November over 100 years ago. Shown above is a trench map dating from October 1916, showing Serre village and the surrounding area. The lines here had changed little since the 1st of July. The four copses, including Luke Copse, are all marked and they are clearly separate pieces of woodland, whereas today one longer piece of woodland encompasses John, Luke and Mark Copses. The German trenches are marked in red whilst the British trenches are in blue. Returning towards the Sheffield Memorial Park, opposite on the left and set above it as the ground rises is Queens Cemetery. This is located in what was what was No Mans Land in 1916, and the slope up to this cemetery shows that the Germans had the advantage of the terrain. The British had to advance up this slope when they attacked, and the German lines were just to the far side of where the cemetery now stands. Within the cemetery, two short flights of steps lead up to a seat from which you can look back towards Sheffield Park and the British front lines. This is again a cemetery made by V Corps in 1917 (originally V Corps Cemetery No. 4), and it contains just over 300 graves. More than a third of these are of unidentified soldiers. The headstones are fairly regular in their layout, although there are some gaps. Private James Knighton was serving with A Company of the Sheffield City Battalion and aged 24 when he died on the 1st of July 1916. James Knighton was a native of Sheffield and before he enlisted was an Assistant Master at Ellesmere Road Council School in the city. The inscription on his grave reads ‘Still lives, still loves, still ours, will meet again, Ma and Dad‘. Named on the same headstone is Private Ernest Hudson, who was the same age, from the same city, served in the same battalion and died on the same day. 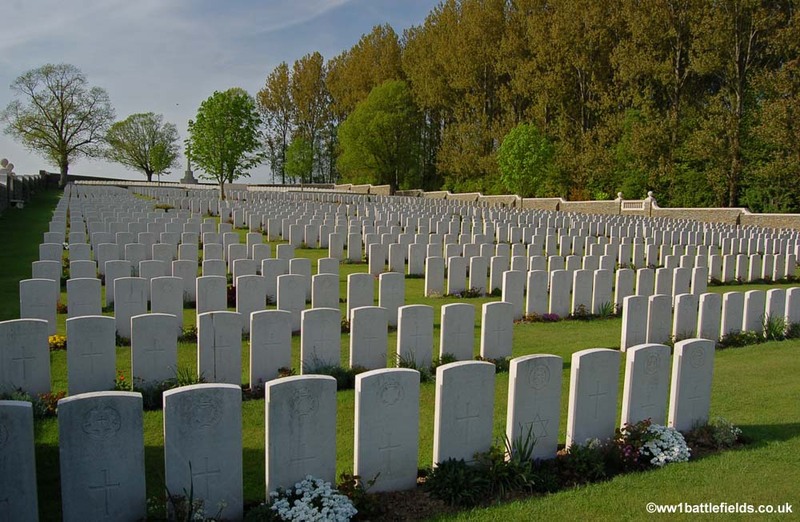 In fact many of the headstones here show two names, or two unknown soldiers, or one known and one unknown soldier. One officer buried here is Lieutenant Stanley Bickersteth. The inscription on his grave reads ‘Fifth son of Dr Bickersteth Vicar of Leeds and Ella his wife. Content.’ Stanley Bickersteth served with the 15th West Yorkshires, joining up in September 1914 and serving initially in Egypt. He was 25 when he died, on the 1st July 1916. His father, Dr Bickersteth went on to become Canon of Canterbury and Chaplain to the King. Returning to the main D919 road down the track, turning right leads to two larger British cemeteries, and a French war cemetery. The first, on the right hand side of the road, is Serre Road No. 1 Cemetery. The German front line trenches crossed the road just by this location in 1916. It is a large cemetery, with one of the highest level of unidentified burials in the area. In spring 1917 following the Germans withdrawal, the battlefields here were cleared by V Corps, and this is another cemetery made at that time. 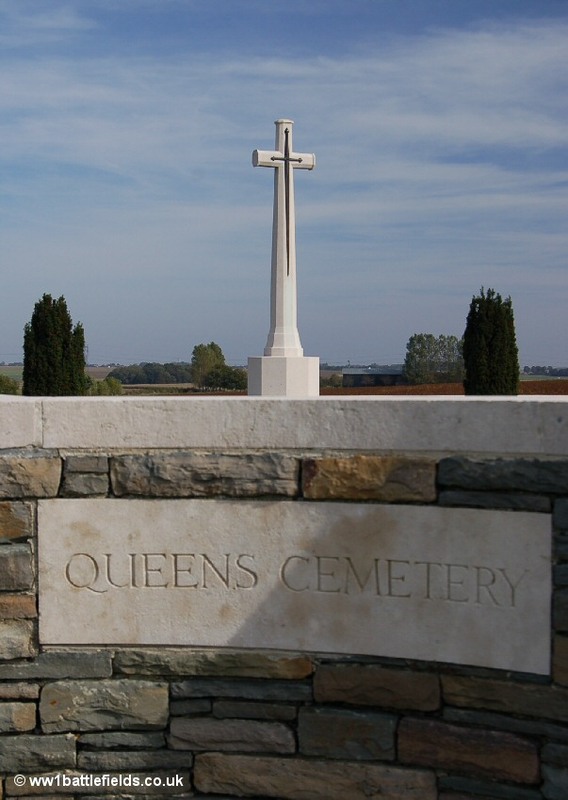 The original cemetery at Serre Road No. 1 comprised graves in Plot 1, rows A-G, which are located at the rear of the cemetery behind the Stone of Remembrance. Many of the graves in Plot 1 are of identified men, but after the Armistice the cemetery was enlarged, and there are now 2,426 burials here. Of these, just under 700 are identified. Nearly three-quarters of the graves are of men ‘Known Unto God’ – although there are special memorials to 22 men who are known or believed to be buried here located at the back left. There are also special memorials to several men who were buried in other cemeteries, but whose graves were later destroyed in other battles. 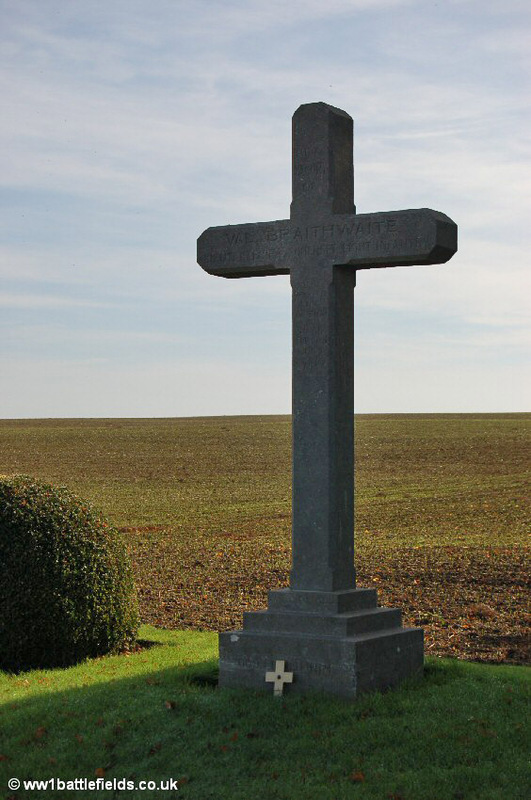 Another pair of brothers is buried here – the Destrube brothers: Charles aged 27 and Paul aged 26. Both were serving with the 22nd Royal Fusiliers, and both died on the 17th of February 1917. 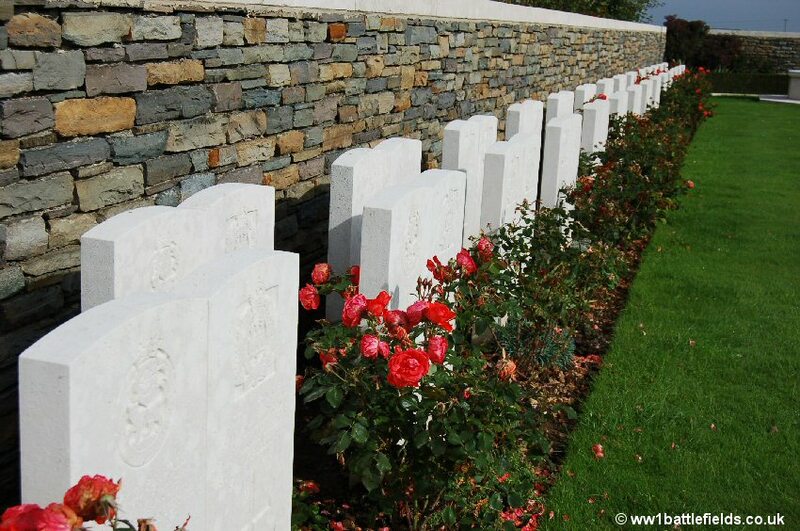 They are buried together, marked by a single headstone, in Plot 4, row C.
Just a little further along from Serre Road No. 1 Cemetery is a French Cemetery. This was made initially by the British, clearing the battlefields after the end of the war. 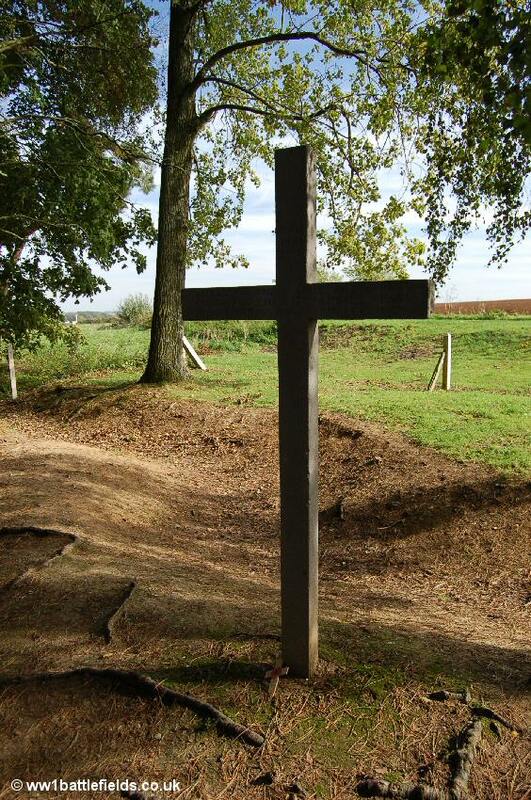 They found the bodies of French soldiers who had been killed attacking Hebuterne in June 1915. More burials of French soldiers were subsequently made here, and the cemetery was handed over to the French in 1933. Opposite the French Cemetery is a memorial chapel (middle photo above), with a plaque on the stairs leading up to it. 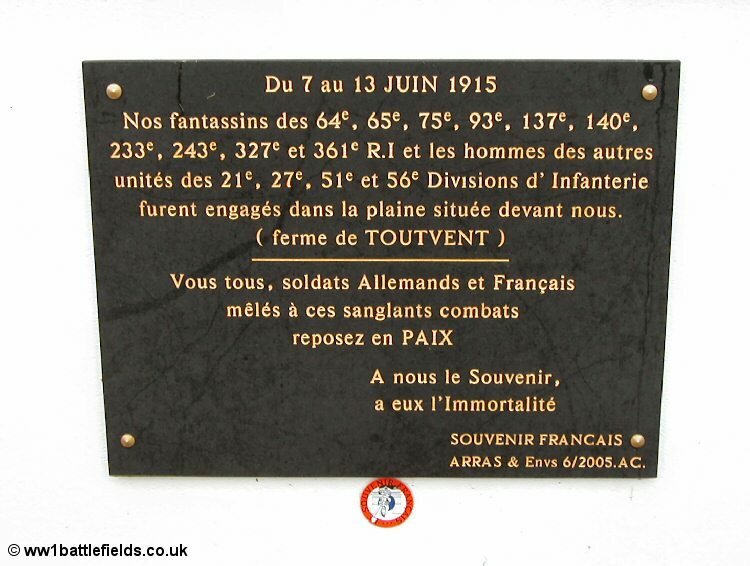 The inscription refers to infantrymen from the listed units and states that they were engaged in the plain located in front of you (Toutvent Farm), and implores “You all, German and French soldiers who took part in those bloody combats, rest in peace. With us the memory, to them the immortality“. 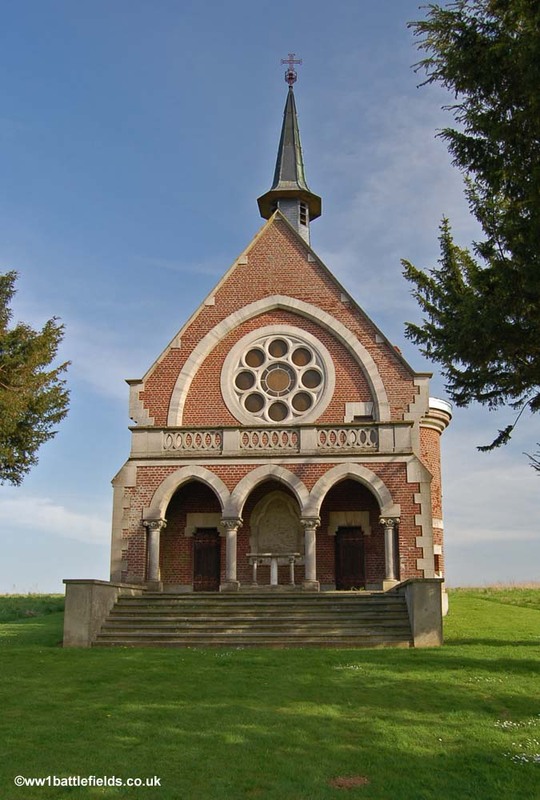 Between the French Chapel and Serre Road No. 2 Cemetery (see below), a memorial can be seen on the right hand side of the road. This is in the form of a small block topped with a bronze tablet. The tablet records that in October 2003 the remains of three soldiers were found near this spot. They were two Germans, from the 121 RIR, who died in June 1915 and who were identified, and one British soldier believed to have died on the 1st of July 1916. 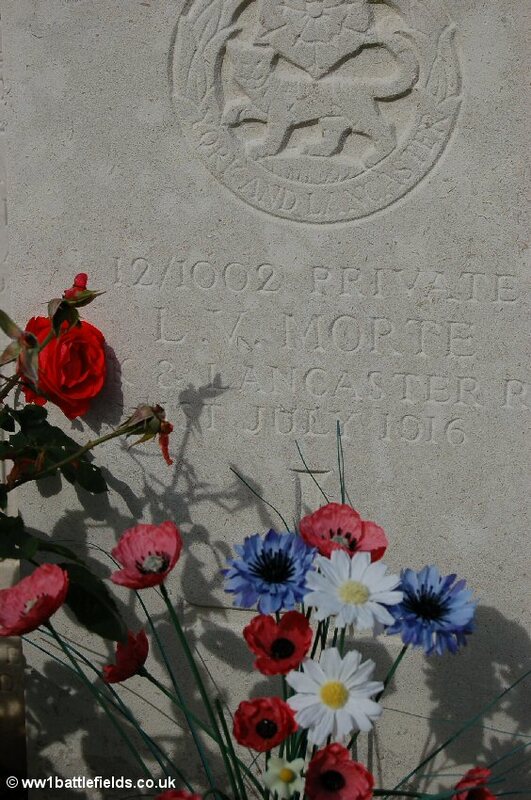 Only his regiment, the King’s Own (Royal Lancasters) could be identified. 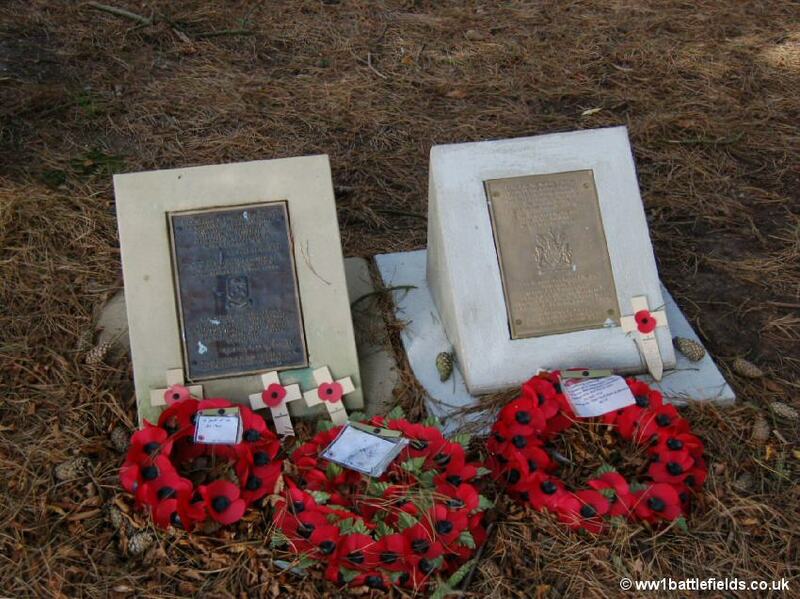 The regimental badges of both units are on either side of the memorial, which was unveiled in June 2006. The memorial records that the remains were reburied ‘with their comrades’: the Germans in Labry German Cemetery near Verdun, and the British soldier at nearby Serre Road No. 2 Cemetery. 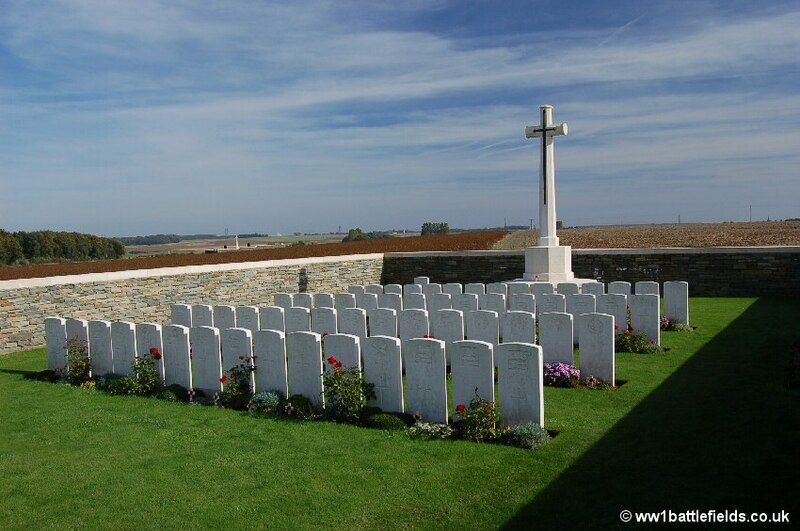 A little further along the road, on the left hand side as the road bends, is Serre Road Number 2 Cemetery. This is a larger cemetery, with over 7,000 burials, nearly 5,000 of which are unidentified. 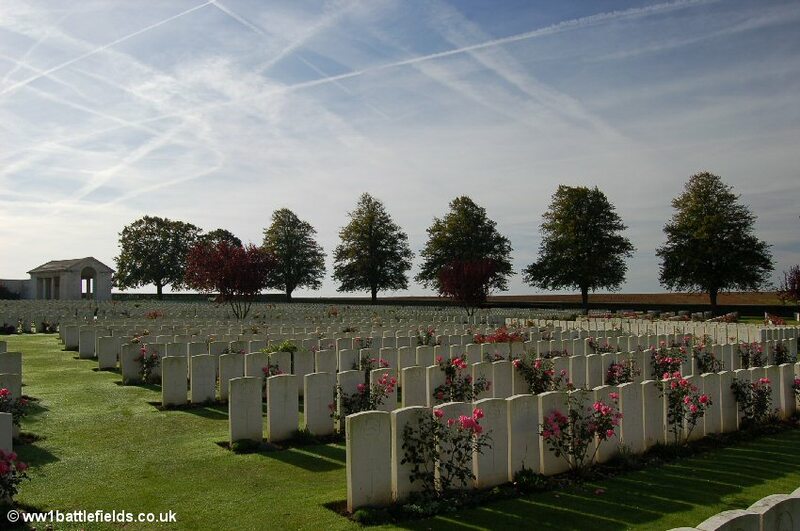 In fact, this cemetery has the largest number of unidentified burials on the Somme, and in France. Again, this was originally a small wartime cemetery, started in May 1917, containing Plots 1 and 2 before the Armistice. Afterwards, burials from at least 16 other small cemeteries or churchyards were brought here. Many more graves must be those of men recovered from the battlefields, as there are now 36 plots. In 1930 a report in The Times described the cemetery as still incomplete, with hundreds of graves of recently recovered soldiers remains marked by temporary wooden crosses. 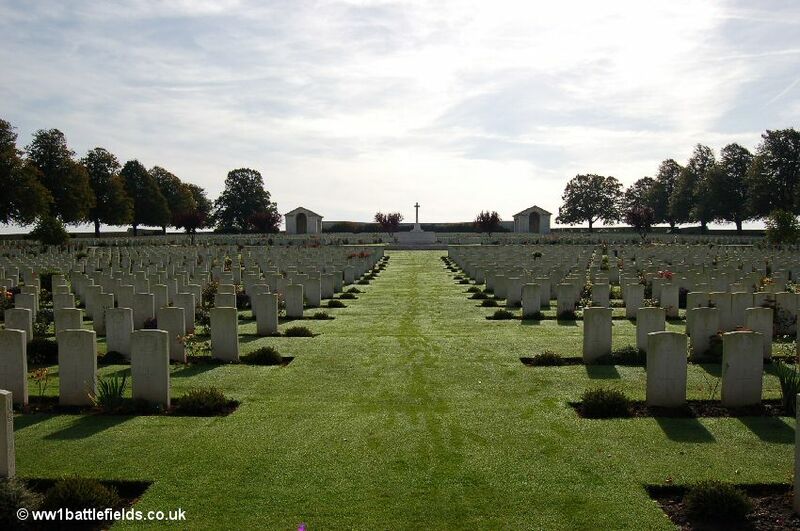 Serre Road Number 2 Cemetery was designed by Sir Edwin Lutyens, and was not completed until 1934. 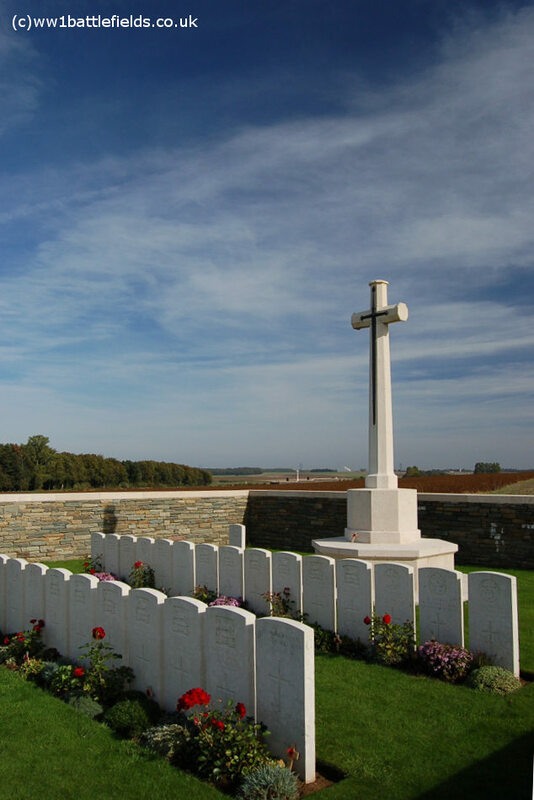 The cemetery is located mainly in what was No Mans Land between the German and British lines during 1916. 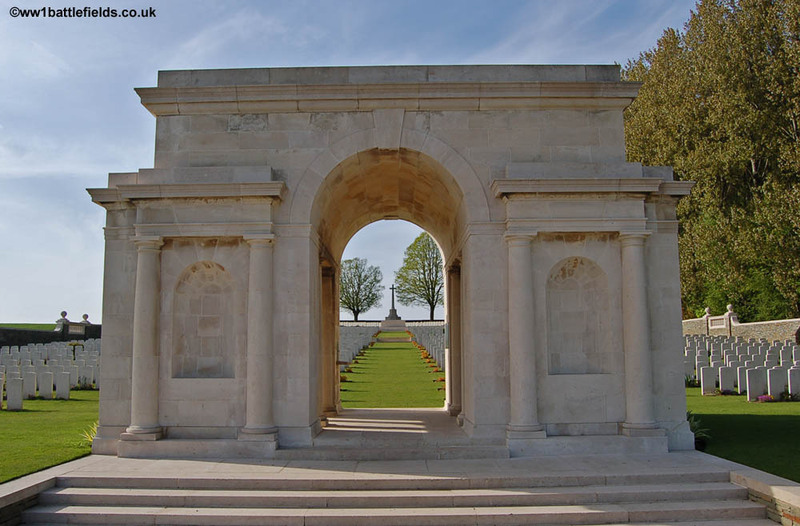 The original burials, Plots 1 and 2, are located behind the Stone of Remembrance, and are mainly 1st of July and 13th of November 1916 men. These headstones are set at a different angle to the later ones. Among those buried here is Captain Francis Dodgson, of the 8th Yorkshires. 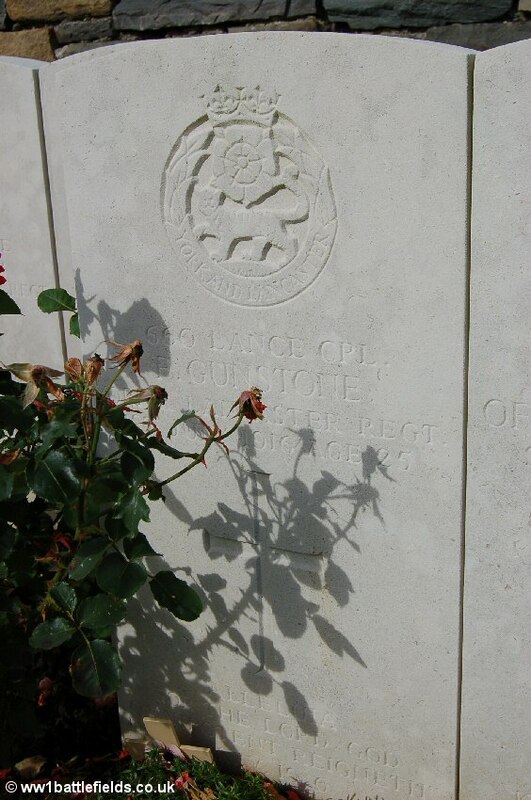 There is a private memorial to him which can be seen beside a field track just to the west of Contalmaison. The CWGC records show that his body was exhumed 8 feet away from that memorial in December 1928. Also buried here is Private Albert Bull, who also has a private memorial in the form of a stone cross by the Sheffield Park front-line trenches (see above). Just outside and to the left of the cemetery is a private memorial to Valentine Ashworth (Val) Braithwaite. This stands on a small mound with conifers at each corner. Braithwaite was a Lieutenant in the 1st Somerset Light Infantry, when he died on the 2nd of July 1916. His name is commemorated on the Thiepval Memorial. The field behind this memorial (right hand picture below) is thought to be where Wilfred Owen experienced the events which inspired his poem The Sentry. This describes a sentry being blinded, one of many Wilfred Owen poems that vividly portrays the realities of war. Owen had arrived in France in the first days of 1917, and on the 6th of January 1917 his battalion, the 2nd Manchesters, moved up to the front. Owen had arranged a code with his mother, Susan, whereby he would be able to give her his location (soldiers were not allowed to put such information in their letters). On the 10th of January he wrote a letter to his mother that included the word ‘Mistletoe’ – the agreed trigger for the code. The second letter in the first word on each of the next five lines spelt out ‘Serre’. Six days later he wrote to his mother again, this time describing how ‘….I have not been at the front. I have been in front of it. I held an advanced post….in the middle of No Man’s Land.’ He goes on to describe the awful experience, and says that although he posted his sentries half-way down the steps of the dug-out they occupied, ‘one lad was blown down and, I am afraid, blinded.’ An excavation was undertaken here, and filmed, featuring in a BBC ‘Ancestors’ programme. Sadly, Wilfred Owen was killed before his talent as a poet was widely recognised – even more tragically, this happened on November the 4th 1918, just a week before the Armistice. He is buried near the village of Ors. 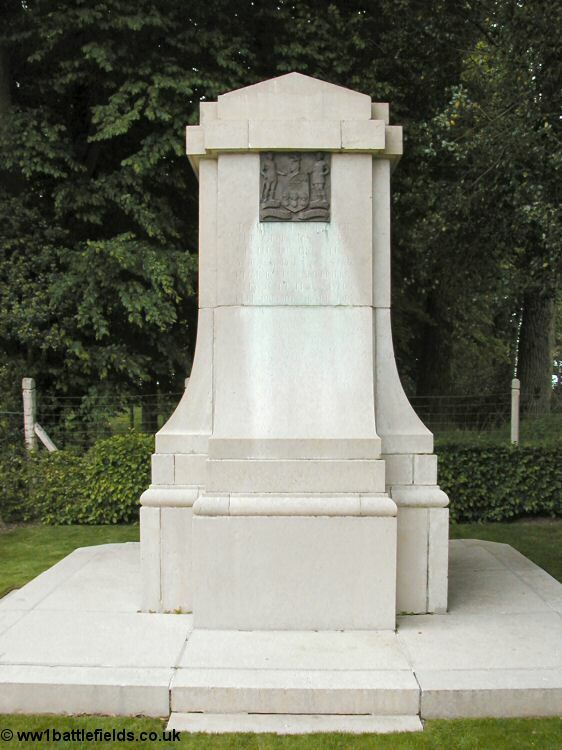 The name of Serre has come to be linked closely with several of the ‘Pals’ battalions, which suffered very heavy losses in the attacks made here. The Pals battalions were part of Kitchener’s Army, and they were formed in specific towns or cities, where battalions were raised following the call to arms. As many of those who enlisted were friends, colleagues or relations, the idea was that by enlisting together in the local Pals battalions they would stay together during their service. The casualty lists that came back after the 1st of July 1916 devastated some of the Pals battalions communities. As friends, colleagues and relations had joined up together, so they often died together. Families, streets and whole communities grieved together when the telegrams arrived. At Serre, the attacking troops were of the 31st Division (part of VIII Corps). At 7.20 a.m. on the 1st of July 1916, the soldiers of the first wave left their trenches, passed through the British wire and lay down in No Man’s Land to await the end of the bombardment. This ceased at 7.30 a.m., and in front of Serre men of the 12th York & Lancaster (Sheffield City Battalion) and the 11th East Lancashires (Accrington Pals) stood and tried to cross No Man’s Land. 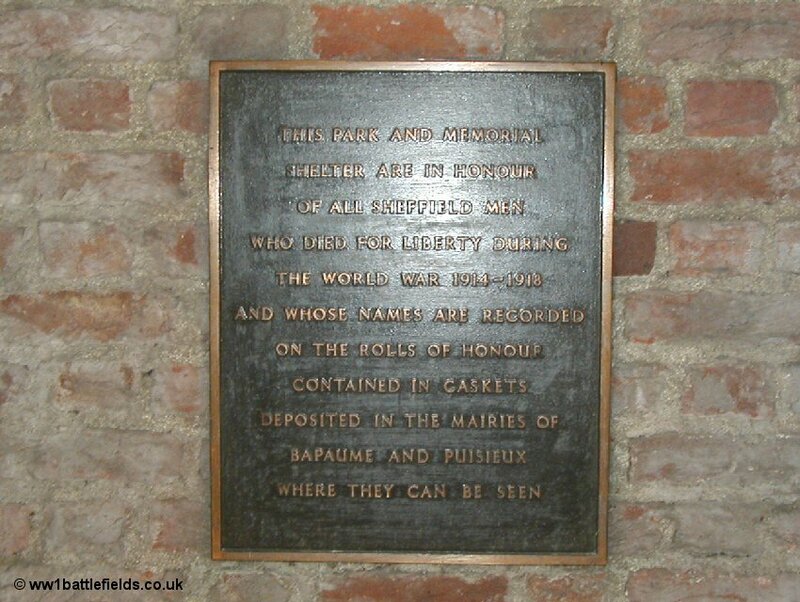 In Serre itself is a memorial to the Sheffield City battalion. 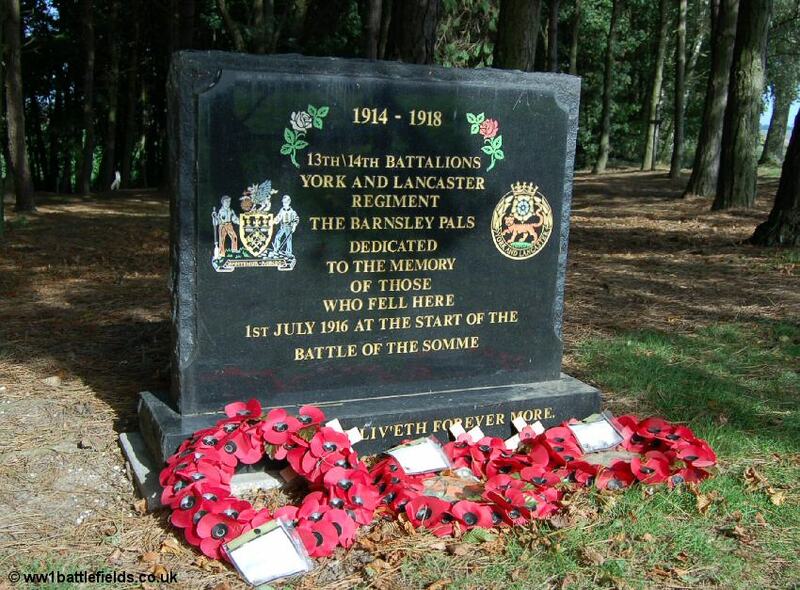 This was unveiled on the 21st of May 1923 in the presence of around 150 men who had fought at Serre in 1916. Prominent citizens from Sheffield were also present at the ceremony, including Gresford Jones who had been the Vicar of Sheffield during the War, and who dedicated the memorial. Some men from the Sheffield City Battalion had actually reached Serre on the 1st of July, and their bodies were found by 3rd Division troops when they briefly entered Serre during the unsuccessful 13th of November 1916 attack four months later. The village was ‘adopted’ by Sheffield after the war. Just to the south, the attackers were the 15th West Yorks (Leeds Pals) and the 16th West Yorks (1st Bradford Pals). The Sheffield City men had laid white tapes which led to gaps in the German wire the night before, but when they attacked these were gone. The attackers were mown down by machine gun fire, and there was an almost total lack of success here. Although one company of the Accrington Pals did reach Serre, but were lost. Reinforcements, men of the 13th and 14th York & Lancasters (the 1st and 2nd Barnsley Pals) were sent in, but were also stopped with no success, and the attack here was then suspended, with no gains made whatsoever. Famously, the Commander-in-Chief, Douglas Haig commented adversely in his diary on VIII Corps performance on the 1st of July. However, the Official History recognised the brave efforts that were made here, often by men facing battle for the first time. It records ‘There was no wavering or attempting to come back, the men fell in their ranks, mostly before the first hundred yards of No Mans Land had been crossed. The magnificent gallantry, discipline and determination displayed by all ranks of this North Country division were of no avail against the concentrated fire-effect of the enemy’s unshaken infantry and artillery‘. The 4th Division (a Regular Army Division) attacked to the south of Serre on the 1st of July, and did manage to reach a strongpoint known as the Quadrilateral. However, they could not hold it and had to retreat just before mid-day on the 2nd of July. The line near Serre was more or less unchanged here even at the end of the Somme battles in November 1916, and on the 13th of November the 3rd Division attacked here – again without success. The village of Serre was evacuated by the Germans in their withdrawal in February 1917, but again lost again to them on the 25th of March 1918. It was retaken as the Allies advanced again on the 14th of August 1918.